Drinking soda can contribute to tooth decay and dental cavities. Sugary beverages coat your teeth, gums and tongue for hours after you drink them. This effect breaks down enamel on your teeth, making them more susceptible to rotting. If you like to enjoy a soda here and there, drink it through a straw. This way, the beverage goes right into the back of your mouth and it is less likely to corrode your teeth. Water does not contribute to dental decay. In fact, water is fluoridated and actually helps strengthen your teeth. During the month of February schools focus on Dental Hygiene. This was a perfect time to try a science experience with my day care kiddos explaining the benefits of water. We poured water in one container and soda in another then added one egg in each container. We left the eggs soak for a few hours. After removing the eggs I explained to the kids what water and soda does to your teeth. oh bad time for me to be drinking a Coke right now. I promise - I drank loads of water while visiting my mom in the hospital -- those places are so dry!! but I needed a little pick me up tonight while reading some blogs as she is resting at home. I cut back from soda after this experiment. Totally freaked me out! 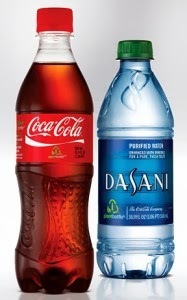 Dasani is now my drink of choice! yes. Especially when the kids ask "Why do you drink soda, Aunt Tami?" BUSTED! Wow you are a good teacher and never too young to learn such a lesson. I loved soda up until last 5 years I still have a ginger ale every now and then. Although I had a cherry coke at five guys last week.....it was once in a while delish! that's a good way to show the difference. Not only the sugar but the acidity does harm too. I have never heard of the straw drinking making a difference. I have my doubts about that. The feeling and taste of the soda in my mouth is the reason I'm drinking it. I don't drink it out of habit. Mostly water for me and my big treat is beer which you shouldn't explain the difference to preschool kids.